In this guide you can find information on how to display a Custom Text on Camera Image. To implement this example, you need to have OZEKI Camera SDK installed, and a reference to OzekiSDK.dll should be added to your Visual Studio project. Addig labels to the camera image has a number of good advantages. This way the viewer can identify the camera and get to know which camera is being displayed currently. This is a big adantage for those users who have many cameras and many of them are displaying image with a similar background. How to display a custom text on camera image using C#? To establish the connection properly between your application and an IP camera you should apply the same code snippet what you have used in the example (How to connect to an IP camera device using C#?). Important: You should study this article in order to find out how to set up your Windows Forms/WPF Application correctly. _mediaConnector.Connect(__camera.VideoChannel, _imageProvider): This method establishes the connection between the image we get from our camera and the image provider object that is used to display the camera's image on the graphical user interface. _videoViewer.SetImageProvider(_imageProvider): We set the image provider to the video viewer object in order to make the application be able to display the image we get from the camera. _camera.Start(): In order to start receiving image from the camera we need to use this method. _videoViewer.Start(): In order to start displaying the image on the GUI we need this method as well. 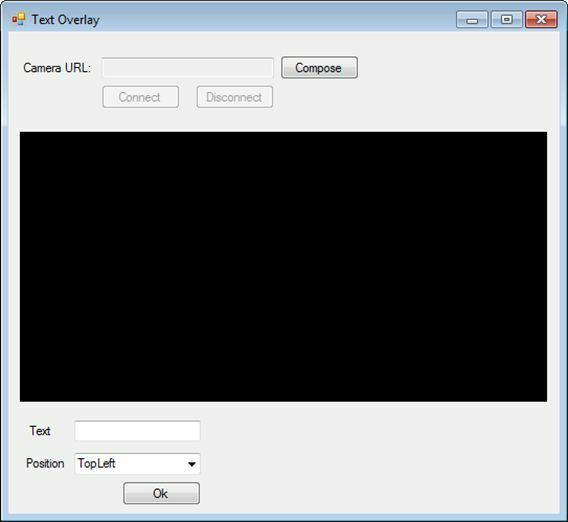 _textOverlay.Start(): In order to start displaying a custom text on camera image we need this method too. _textOverlay. : We can set the text properties (FONT and Brush) on Camera Image with this method. Below you can find the code that belongs to the interface of the previously presented application. Clicking the "Start" button begins the recording process and when you push the "Stop" button the process ends. The interval of the recorded audio will be the interval between the two button hits. During the recording I got an error. Why?